Staer9 wrote: to me it looks like an extra object, try going in object mode, selecting it, and deleting it. sometimes artifacts like this are left after some separation and smoothing of areas (which sounds like what you did). That was it. Thanks again, Staer9. Good to know that. Sounds like a case of reversed Normals. Before I unwrap a model, I always go into Texture Paint mode to check if the Normals are reversed on any part of the ship. If the Normals are reversed, whole faces of the ship will seem to not be there, and nothing can be done with them in that state. What has happened is the outside surface, the part you have been forming to whatever shape you intend, has faces that for reasons unknown to me are flipped inside out, so that you can see through it. That's the way it would appear from the inside of the ship, if the Normals were correct. You have to select the vertices surrounding any area that show white, go to Mesh on the bottom tool bar, left click on that and pan up to Normals. You will see three options, but the one you want is "Flip Normals". That has to be done in Edit Mode. Be careful to select only the face that is showing white, because if you also select a face right next to it that isn't reversed to begin with, you will then flip that face inside out while flipping the intended face right side out. You can still do this, even after unwrapping, but you need to put the unwrap aside for a while, return to Edit Mode, and do what I described above. Once more, you can check on which faces you want to select by just going back and forth between Texture Paint Mode, and Edit Mode. Texture Paint Mode will show what normals are flipped, as you will be able to see through those faces that are flipped inside out, and need correcting. Selecting the flipped face in Edit Mode to flip it to Normal as described above, and then rechecking in Texture Paint Mode will eventually get the whole model right side out, and THEN you should be able to work with it in unwrap. Does that make sense?. Many thanks Mandoman. Problem solved. Clone Wards Acclamator Class, hopefully coming to a spacelane near you fairly soon. Amaranth wrote: Many thanks Mandoman. Problem solved. Very nice, Amaranth. I'll be watching for it. Does anyone know if it's possible to add to, or alter details on a model in Blender, AFTER it's been unwrapped, and textured, WITHOUT having to re-unwrap it, and re-paint it? I should catch mistakes BEFORE I unwrap, I know, but let's face it, I just don't catch everything every time. I notice my last question went unanswered. Oh well, here's another. Can any one tell me WHY some parts of a model will only fit to the over-all model by adjusting it so in Object Mode, therefore making it look like a mess in Edit Mode (Stear9)? Also, is there a way to prevent this occurrence before it starts (Staer9)? mandoman wrote: Does anyone know if it's possible to add to, or alter details on a model in Blender, AFTER it's been unwrapped, and textured, WITHOUT having to re-unwrap it, and re-paint it? I should catch mistakes BEFORE I unwrap, I know, but let's face it, I just don't catch everything every time. Oh, I can alter the shape of an unwrapped part in Blender without ruining the texture, and such. 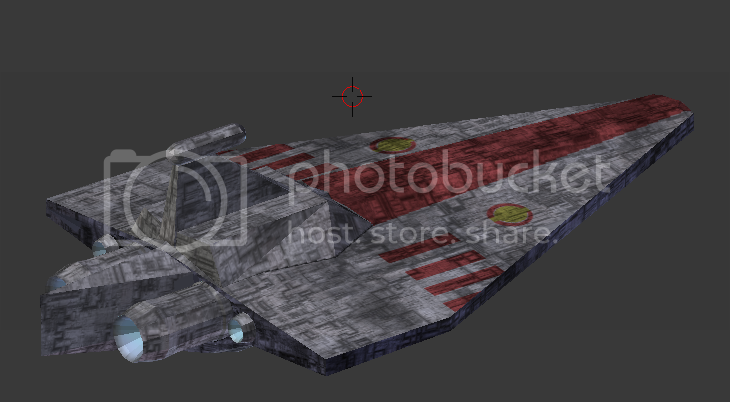 It's trying to add anything new TO the model AFTER texturing that seems to be a flop. I don't think it can be done, but I don't know for sure. Thanks Paradox. I seem to be full of......well, you know, questions. I'm working on a ship design that when finished am hoping to have the front canopy see through, so the bridge and other details of the front of the ship can be seen in game. I put a flat wall over the area that should be "see through", and flipped the normals. When I look at it in Texture Paint, or Object Mode, the wall is not apparent, and the open interior is viewable. My question is, will this work in the game? Will the game treat the open area as a see through part of the ship, or will it see it as an open hole in the ship? Thanks. Transparent cockpits have been discussed before, so I don't think that will work, I'm afraid you'll just get the 'hole'. Smivs wrote: Transparent cockpits have been discussed before, so I don't think that will work, I'm afraid you'll just get the 'hole'. Shoot! Oh well, it was just a thought. Thanks Smivs. The current workflow for exporting meshes looked a little tedious, so I took an afternoon and wrote a script that exports a Blender mesh directly to a .dat file. It can be installed just like any other Blender add-on (by putting it in the add-ons directory). You'll also need to enable the add-on in File -> User Preferences -> Addons; look under the "Import-Export" tab. Once it's installed, just select the mesh object you want to export and use File -> Export -> Oolite (.dat). Note that if the model has a UV map, every face must have a texture assigned, or the script will complain loudly. The script might also be somewhat buggy, but I haven't run into any major unfixed bugs yet.